Field trip planning just got a whole lot easier. 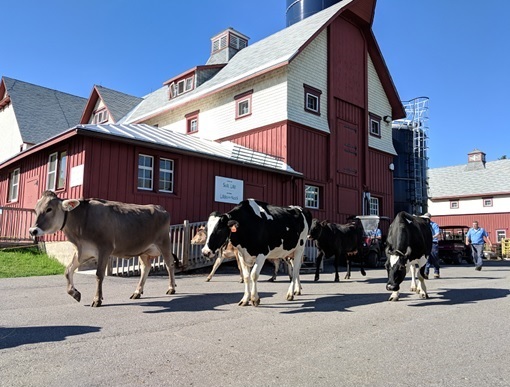 Thanks to the power of virtual reality, teachers based anywhere in the world can now take their students on an educational tour of the dairy barn at the Canada Agriculture and Food Museum — which is also a working farm in Ottawa, Canada. The museum has partnered with Google Arts & Culture to develop “Explore a Working Dairy Barn,” a virtual reality (VR) expedition available through the Google Expeditions app. Nadine Dagenais Dessaint, who works as an education, interpretation, and exhibition officer for the museum, explains that the virtual tour offers users exclusive access to rarely-seen areas of the farm, which is located on a national heritage site. Dagenais Dessaint adds that the content of the tour is also unlike a physical trip to the museum. Anna Szoc, a coordinator with the Google Cultural Institute, says the tour of the Canada Agriculture and Food Museum will open up new possibilities for educators in Canada and beyond. Szoc adds that the tour was created using 3D photography, and is designed to be viewed using a smartphone within a Google Cardboard viewer. The tour can also be viewed with a smartphone or tablet without using Google Cardboard. There are nine slides — or panoramas — with each one offering between three and five points of interest. “If it’s an expedition with a teacher, then the teacher has a tablet and controls where the pupils are and what they’re looking at,” explains Szoc. The museum has also prepared several streams of questions that teachers can pose to their students about the tour, which are age-appropriate for different grade levels and linked to the provincial and territorial educational curricula. A narrated audio file is also available for users who want to take a solo trip. Szoc says that the expedition tour of the Canada Agriculture and Food Museum is just one of the many expeditions Google Arts & Culture is making available. 1) Download the Google Expeditions app for iOS or Android. 2) Launch Google Expeditions, then search for: Explore a Working Dairy Barn. 3) Download the tour — it is now added to your library! 4) View with or without a VR viewer.